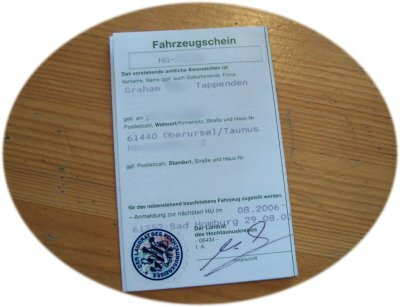 One of the best things about the German registration system is that you must arrange insurance for the car before you go to the Zulassungsstelle to register it. If you do not, then you will either not receive any number plates to put on the car, or at the very least they will not have valid stickers on them, making uninsured cars very easy to spot on German roads. 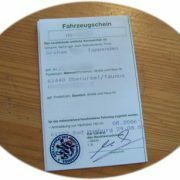 So before you go to register the car, you used to call your insurance company and they would send you a white card called a Doppeldeckungskarte. Originally this consisted of two identical parts, hence the Doppel in the name. When you registered ownership of the car, one part stayed with the registration office and the other was used to notify the insurance company that you had been there and completed the process. The card also had some insurance implications, such as 3rd party cover for the journey to and from the registration office. The format of the card changed slightly in 2003, when the Doppel part got dropped, and was replaced with an electronic system. But you still needed the single white card to register the car. Now (and apparently since 2008) everything is electronic. When I called my insurance company last year, they just dictated a code to me over the phone consisting of numbers and letters. This is called a VB-Nummer, and it replaces all of the paperwork that used to take place between the registration office and the insurance company. Everything happens electronically, so the only piece of paper involved was the one that I noted the code on! Needless to say that after registering the car you still need to sign a contract with the insurance company for them to cover the car long-term. Of course, you can do this on-line as well, but for once I still prefer to go to my agent and actually sign a piece of paper instead.